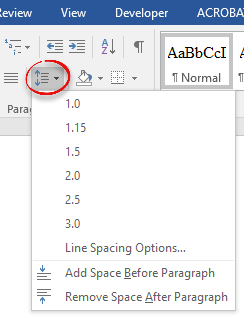 You can format Microsoft Word to not add spaces between paragraphs. Step 1:On the Home tab in the ribbon, go to the Paragraph section. Click the small arrow on the right hand side of the Paragraph box. Step 2:A dialogue box will open to edit Indents and Spacing, and Line and Page Breaks. Select Indents and Spacing (this should be the default) and find the Spacing section near the bottom. Check the box that says Don’t add space between paragraphs of the same style. 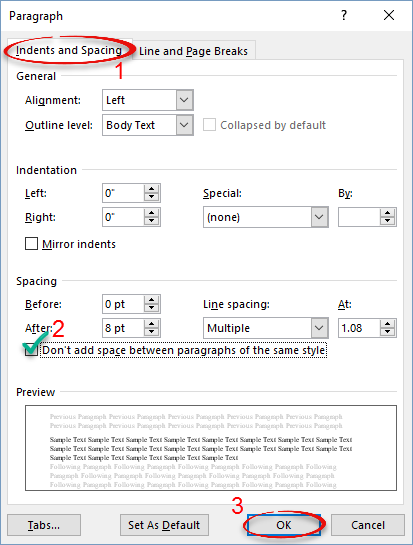 Step 3:To edit line spacing, you can use the dialogue box for Indents and Spacing or there is a quick access version in the Paragraph section of the Ribbon. With this drop down box, you can change the amount of space between lines, (hint: the most common is 2.0 line spacing.) You can also add or remove a space before or after a paragraph.